Friday January 26, 1923 I am better of my cold after spending most of the day in bed. weather fine. Wrote Hattie. Mrs F had callers. Saturday January 27, 1923 I felt better today. Did up a box of nuts to mail to Hattie. Wrote Ella Wilcox and Laura Mason. Went down town with Mrs Falk late in afternoon. Evening at home. Sunday January 28, 1923 Went to ME Church to SS and church. We had dinner at Hutchinson Hall. Came directly home. I wrote to Rob, Edith Whetstone, Jennie Sterritt, Mary Holson, Mrs John Peckham and Roxie Robeneau. We had music in evening. Warm day. Monday January 29, 1923 I did some washing for my self in forenoon and crotched on lace. Mrs Falk and I to town in PM. To a picture show Tuesday January 30, 1923 I did some work up stairs and crotched on lace. I finished it. After dinner wrote Ott and Mrs Edwards at Coralville. Mrs Falk and I went to The Womens Club in PM. Letter from Paul Whetstone. Wednesday January 31, 1923 Did some sewing in AM and went up to Nuttings. I wrote to Sciota Lope after dinner. Had callers in afternoon. Went down town for the mail. Letter from Paul Whetstone. We all went to church in evening and to picture show. 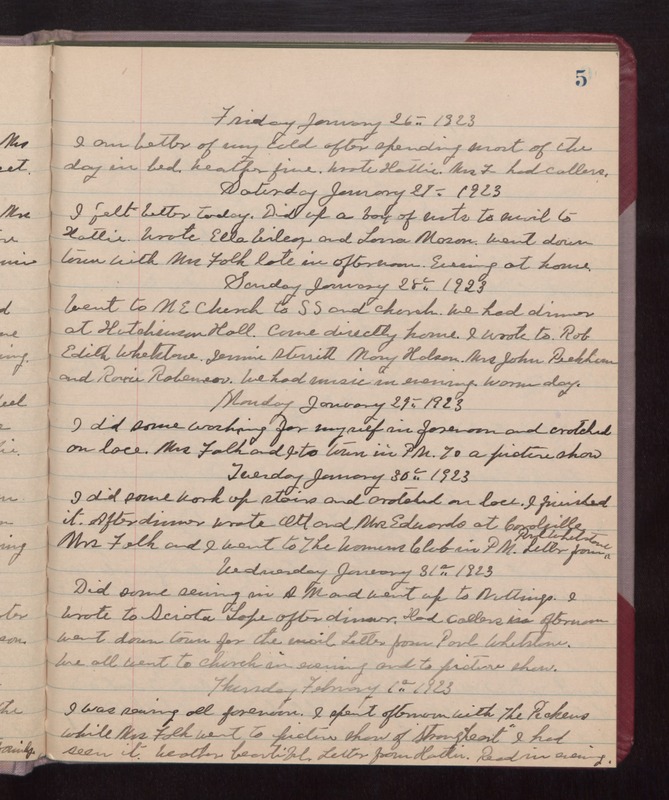 Thursday February 1, 1923 I was sewing all forenoon. I spent afternoon with The Pickens while Mrs Falk went to picture show of "Strongheart." I had seen it. Weather beautiful. Letter from Hattie. Read in evening.